James Hawk, chairman, Toyo Tire Holdings of Americas Inc., is the 2013 Rubber and Plastics News Executive of the Year. WHITE, Ga.—In the beginning, there was nothing. Now, Toyo Tire & Rubber Co. Ltd.'s only manufacturing facility in the U.S. can't seem to stop growing. The White plant just broke ground in December on its fourth expansion since it began production in 2005. The firm will increase the size of the plant to nearly 3 million square feet, add 450 employees by the end of 2015 and boost its capacity to an estimated 8 million passenger, light truck and sport-utility vehicle tires by 2018. If it reaches full capacity, Toyo will have invested nearly $1 billion in the plant since it opened. 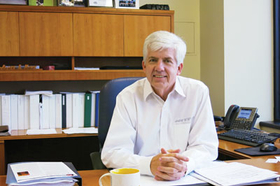 Not coincidentally, the facility's president and general manager, James Hawk, also has climbed Toyo's ranks as the plant grew, even in times of economic downturn. For helping to successfully guide Toyo Tire North America Manufacturing Inc. to its current heights, Hawk has been named Rubber & Plastics News 2013 Rubber Industry Executive of the Year. A career in the rubber industry seemed to be Hawk's destiny. He grew up in Akron's Firestone Park neighborhood, and his father was a truck tire builder for Firestone for nearly 40 years. Hawk began his career right after he graduated from the University of Akron with a degree in mechanical engineering in 1973. He went to work for Continental Tire as a project engineer. And if he wound up retiring an engineer, that would have been fine. But Hawk never has been one to shy away from new horizons—in fact just the opposite. He is always asking questions, always says yes to a new opportunity. If engineering got him into the industry, it was his curiosity that sparked his ascent through the ranks. It is the main reason he got involved with several major plant expansions with General Tire, either expanding existing facilities or building new ones. Through those experiences, his fingerprints were on many different areas of the industry, and he became well-versed in how a plant operates from start to finish. 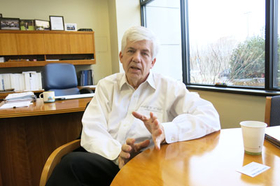 Just when Continental was taking over General Tire in the late 1980s, he developed relationships with European managers. They encouraged Hawk to enter production and production management. He decided to try something different and went to Mount Vernon, Ill., to help start the GTY Tire Co. facility there as project manager. Eventually, he transitioned to become the first production manager for that joint venture facility. His nearly 23-year tenure with General Tire ended in 1995 when he accepted a position to become vice president, manufacturing, and plant manager of Yokohama's Salem, Va., facility. He stayed there for nine years and oversaw expansions to the facility. Nine years after he joined Yokohama, Toyo recruited him to oversee its first manufacturing facility in North America. He accepted the position of vice president of operations and plant general manager for its White facility. He has been promoted twice with Toyo: First in 2008 when he became the first—and only—American to serve on Toyo Tire & Rubber Co.'s board of directors as senior corporate officer. At that time, he was also appointed president of Toyo Tire North America Manufacturing. And in 2012, he was named chairman of Toyo Tire Holdings of Americas, its North American business unit. Hawk and his executive team built the White operation from scratch. It manufactures a wide-range of tires for cars, light trucks and SUVs in speed ratings ranging from S to Y and two different brands—Toyo and Nitto. Light truck comprises about 45 percent of the plant's total output. Passenger tires account for 33 percent and SUVs the rest. But the facility just doesn't mass produce as many tires as possible. Hawk said one of his main responsibilities is managing inventory and catering lot sizes to specific needs of the dealer. It was a Japanese philosophy and one that took him time to adapt to, after spending most of his life dealing with production efficiency. Hawk said the Japanese call it sleeping money: Tires just waiting in a warehouse for someone to buy them. Toyo analyzes its sales and tries to the best of its ability to produce what it needs without stockpiling the warehouse full of tires. The facility also uses Toyo's Advanced Tire Operation Module process, which is a totally hands-free, highly repeatable tire manufacturing process. Hawk said the technology has evolved over an 8-10 year period. The process constructs a tire on a single module that can build up to seven tires at one time. The plant has 32 ATOM machines, with the fourth expansion adding nine more. The other advantage to the ATOM process is it allows the facility to grow in a modular fashion. Hawk said Toyo doesn't need to have a huge manufacturing facility and then go look for business; rather the company can grow its facility with its current and incremental business. Toyo approved the expansion despite the economic downturn in 2008. Hawk said senior leadership didn't blink when the issue of putting the third phase on hold was discussed. The expansion went ahead; when the economy improved, Toyo had a new addition ready. Hawk said the payoff has been fantastic. The most rapid growth has been on the Nitto side. It was created as a stand-alone business with separate products and dealers, but it grew through the edginess of the high-performance market. He estimates the Nitto brand has gone from a $100 million business to about a $500 million business in the last seven years. Other habits on his sheet include avoid jumping to conclusions, not accepting information at face value and—perhaps most importantly—show flexibility and willingness to consider alternate ideas and opinions. Hawk tries to put himself in his employees' shoes. If someone was micromanaging him every day, he would get the impression that he is not capable of doing the job he is assigned. Instead, he sets the course, establishes the goals and trusts his employees' way of getting there. Hawk will challenge his employees, especially new ones, to see what kind of character they reveal. He will give them control of their own program, making them responsible and holding them accountable for its success. It also means there will be mistakes that come with inexperience, but Hawk won't ever set his employees up for failure. He's not afraid to let them make mistakes and learn from the experience. He also is obsessed with promoting from within. Hawk said nearly all of Toyo's supervisors came out of production. He is not opposed to hiring from the outside, but he would much rather grow his work force organically. “You have to know when it is the appropriate time to hire someone from the outside to give yourself a different look and perspective on how other businesses work,” Hawk said. Huggins is a perfect example. At Continental, he began as a controller, but then he switched to purchasing, holding that position for several years. He joined Toyo as a purchasing engineer, but a year later the CFO position opened up on the finance side. Hawk asked him to fill it because of his prior experience as a controller. Since he left that area, Huggins said another organization likely would not have given him the opportunity to return, perhaps filling the position from outside. Hawk's philosophy when it comes to hiring gives his employees more of an incentive to be a contributor, Huggins said. They feel they can contribute and work their way up the company.